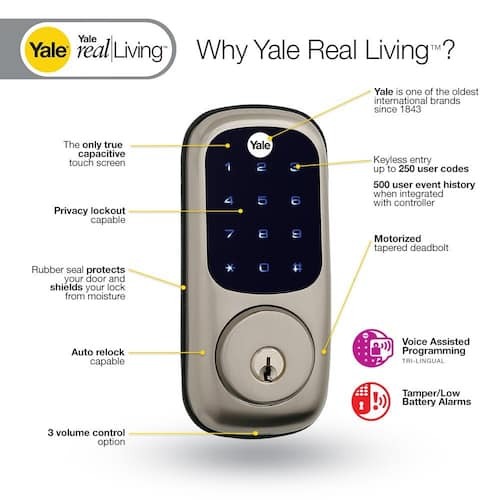 The Yale Real Living Touchscreen Deadbolt comes with very elegant design, an intuitive touchscreen operation, wireless connectivity, voice features and some very cutting-edge capabilities. The lock comes with a variety of features and personalised settings for multiple users ensuring that the top-level security is thus maintained. The lock also offers some of the very handy features. Once you have completed the manual installation [Read: How to install the Yale Real Living Touchscreen Deadbolt?] and ensured that all the fittings are in the right place, go through the following videos step wise in order to explore all the features of Yale Real Living TouchScreen Deadbolt. Now, you will be completely aware of all the features of your Yale Real Living Touchscreen Deadbolt. As said earlier, the good thing about this feature-rich lock from Yale is that it come with a separate wireless module that extends the functionality of the lock and its control operations over wireless commands.